Psychedelic heavyweight Earthless have announced their supporting acts for their Australia/New Zealand tour. Their support line up is heady and heavy, meaning that each show is going to be stuffed with rock n roll greatness. Long-time buddies and local stoner kings, Seedy Jeezus are the special guests for the Melbourne show. They have a great history together, having backed the Earthless guitarist Isaiah Mitchell on tour and having recorded an album with the same under the name Tranquonauts. With a quick hop and a skip over to New Zealand and we have up and coming heads Ounce as the main support for all kiwi shows. Ounce are gearing up to drop their forthcoming album OZ. Wellington psych 3-piece Transistor are opening the Wellington and Tauranga shows. Missing Australia, Earthless head back to hit Wollongong with locals Velvet Elevator and Sydney's Grinding Eyes as the opening acts. Space Carbonara open up their show at the Basement in Canberra as well as being one of three supports for Earthless' super cosmic night at Sydney's Crowbar (formerly the Bald Faced Stag.) Frozen Planet... 1969 and Grinding Eyes make up the rest of the trio for this heady night. 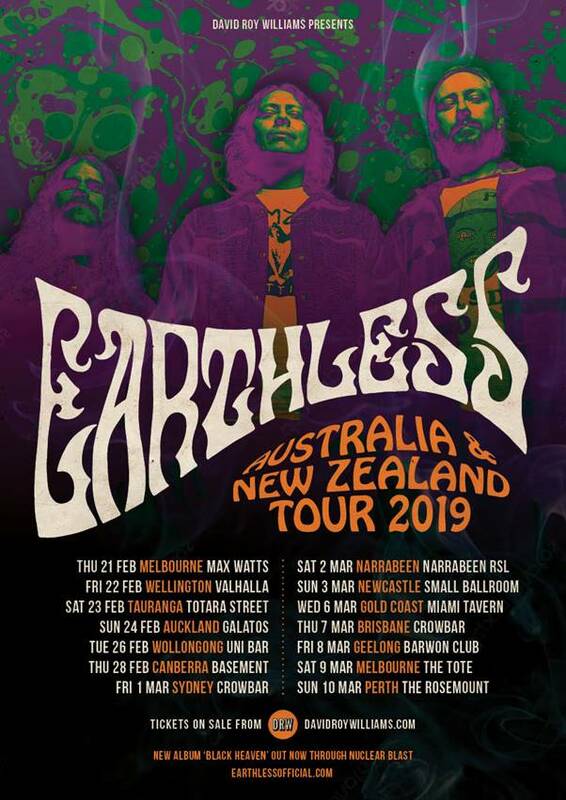 Grinding Eyes travels with Earthless to Narabeen for their show at the Narabeen RSL, joined by well-loved locals Turtle Skull. Tour recognised-faces Space Carbonara hop back into the saddle for the Newcastle show. Heading north, Earthless have the brand new heavy rock supergroup The Black Armada opening the Gold Coast show. Heavy and heady locals Zong are with Earthless in Brisbane before Earthless returns south to hit Geelong. Buried Feather and Pseudo Mind Hive are the guests at the Geelong show. The recently announced second Melbourne show will be opened by two of the finests new hard rock n roll & psych bands Australia has to offer: ROT TV and Psychobabel. The tour finishes off out west at the Rosemount in North Perth, with guests Datura4 featuring local legends Dom Mariani and Greg Hitchcock.